Woo-hoo! It’s Perfect Picture Book Friday! So there you have it! Wasn’t that the shortest post ever? Oh, except, due to a blog comment yesterday I’m all worried about my comment system. I’m going to try replying differently. I would be EXTREMELY grateful if you guys could let me know if you’re receiving my replies to your inbox or not today! Monday Short & Sweet – Happy Memorial Day! I have read these ones many times! My daughter used o love them. Especially the one where they ate the sofa! Wow. That WAS short. Wow. I LOVE the cover! It is pretty funny! I love Dav Pilkey's books! I really liked Cat Kong and Dogzilla! How cute and what a change from Captain Underpants. I love few words too, so I'll look out for this. Thanks, Susanna! I love the George and Martha books, so I know I would enjoy this one. I'll be on the lookout for it. . . How fun! Been a fan of Dav since The Halloweener Dog and Cat Kong etc. This looks so appealing. Thanks for sharing, Susanna! I agree it sounds like the book is for ages 3-6 based on the excerpt. Sounds cute! I hope you like it! 🙂 Will you let me know if you get this reply? This book sounds like a great one for the classroom! Kids would love those opposite worksheets! I do not get all comments. Just your replies to my comment, which is exactly perfect! I will let you know if I get today's reply. Well, my dog has demanded I find this book at our library! (She was reading over my shoulder.) I've been rec'vg an email from you whenever you reply to my comments. HOWEVER—when I tried to comment today it wouldn't let me do it the way I always have. It said my email was already in use by someone else. When I tried signing in through Disqus it wouldn't accept me 😦 So I finally signed in with my gmail account. ??? Hope you have a grand weekend. We have a parade and a carnival at our church to participate in – it will be a busy one. This is a cute book. Like the theme about best friends and trouble. Very different from Captain Underpants. Like your activities. Sounds like a very cute book. I do get your posts in my email and your comment responses as well. Cupcake is 2 paws up on this one. Plus I LOVE The Stupids. Hilarious! haha! Dog Week! Excellent! 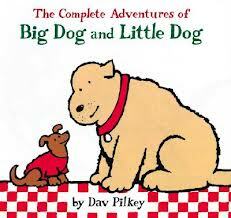 I've not seen these Big and Little Dog books before. But I like Dav Pilkey. He did Dogzilla! I'll have to check this one out! Thanks for sharing! Hah! For once, I know (and adore) a PPBF book! 😉 My kids are intimately familiar with Captain Underpants (I won't tell you what our secret identity names are…*groan*) but before they fell under the spell of CU, we were all HUUUUGE fans of the sweeter (or at least the more endearing, and not so potty-entrenched) side of Dav Pilkey via all his wonderful Dragon books. 🙂 Like some other commenters, I also loved his Kat Kong, Dogzilla, Halloweiner, etc. books. He's the insane brother I wish I had. LOL! Have a fabulous Friday, Susanna! Hm. Can I accept Pilkey without the poop jokes? a short comment for your short post: book looks appealing—agree that younger ones can enjoy it. I would never have looked for this type of book from Dav Pilkey, Thanks for posting this. I just hope my library has it. It is a bit different than his usual fare – very cute and sweet for the little ones! I think you're right – I might change it. It really is best for the little ones! Glad you like the book, Rosi, and thanks so much for letting me know about the comments! I'm anxious to know if you get this one, Penny, because I'm trying replying a different way!